John was born in Skortsinou, Greece on November 8, 1935, the son of the late Dionysius and Panayiota (Yeotis) Chinonis. John immigrated to the United States in September, 1950 at the age of 14, where he traveled alone to live with his brother, Elias and sister-in-law, Katie from 1950 through 1970 in Flint, Michigan. He graduated from Flint Central High School, Flint Junior College (Mott CC), began Wayne State University Pharmacy School and graduated from the Ferris State University College of Pharmacy, where he also met the love of his life, Linda (Hall). John and Linda married on October 10, 1971. Having a successful business career as the owner of Franklin Pharmacy, Belsay Square Pharmacy and co-founder of YaYa’s Flame Broiled Chicken, all in Flint, Michigan, John devoted countless hours to giving back. Through his parish, the Assumption Greek Orthodox Church, he co-created the Assumption Greek Festival in 1975 which provided funding for the church for over 40 years, founded the Assumption Golf Tournament, established the Greater Flint Orthodox Endowment Fund, served on Parish Council and led the church’s efforts to the development and completion of the new, current site of the Assumption Church in Grand Blanc, MI. As an active member of the American Hellenic Educational Progressive Association (AHEPA), he served as National Chairman and National Advisor to the Sons of Pericles. He received the AHEPAN of the Year Award and National Leadership Awards. Through his alma mater, Mott Community College, John received an honorary Degree in Community Leadership and sat on the Endowment Fund Committee. Through Ferris State University, John led numerous fundraising efforts, including the creation of the Ferris State University Alumni Golf Tournament. He also created the Pharmacist Assistance Personnel program, the first-ever licensed Michigan Pharmacist Association position of its kind. John received the Distinguished Alumni Award from Ferris State University. John’s other passions included hunting, snowmobiling and spending time with his wife and family at Durkee Lakes Hunt Club. 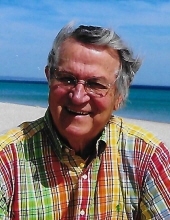 He loved the game of golf and was a longtime member of Warwick Hills Country Club. Sitting in his deer blind at Durkee, sitting by the pool in St. Thomas, USVI, or riding his pontoon boat on Lake Fenton, grandchildren in sight, John would often say there’s no place he’d rather be. John is survived by his wife, Linda, children Dennis (Patricia) and Tom (Elizabeth), grandchildren Kate, CoCo, John, James and Kasey, brother Pano, sister Vaso (Hasoulas, late husband, Stephano), brothers-in-law Patrick (Joann) Hall and Michael (Linda) Hall and many cousins, nieces and nephews. He was preceded in death by his parents, brothers Elias (Katie) and Constantine “Gus” (Sandra). To send flowers or a remembrance gift to the family of John Dennis Chinonis, please visit our Tribute Store. "Email Address" would like to share the life celebration of John Dennis Chinonis. Click on the "link" to go to share a favorite memory or leave a condolence message for the family.